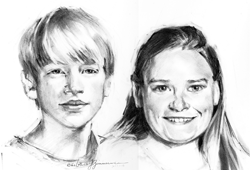 The tragic death of both of their children, Shawn and Kacy, from congenital heart defects led the Campbells to investigate a way in which new meaning might come from this heartbreak. Doing something for others children seemed to be the best way to help ease the pain and at the same time express to others how much their children had meant to them. Neither Tom or Edy attended Ashland University, nor did their children. However, the Campbell connection is strong through Toms siblings and mother being alums. After an initial attempt to establish a scholarship in their local community, it was determined that Ashland University could better administer the scholarship and attend to the ongoing gift and estate planning the Campbells desired. The Campbells have enjoyed meeting some of the scholarship recipients to augment this memorial to their children.